Specialists In Video Slots & Games? 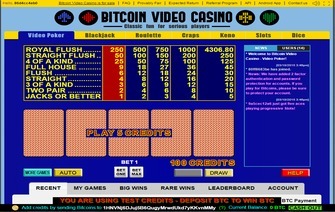 In the later part of 2012, Bitcoinvideocasino.com (formerly bitcoinvideopoker.com), was launched as a Bitcoin casino that’s goal was to have a retro style feel to it. It was designed to be an online version of what real casinos used to look like in the 80’s and 90’s, with the video machine style of play. It features the basic games that most casinos do, but coupled with a retro experience, it is an enjoyable place to play for anyone wanting classic versions of classic games. As mentioned prior, BitcoinVideoCasino.com will not attract players who seek the thrills of playing at larger casinos. Bitcoin Video Casino is a site that is tailored to an older generation of players, and players who enjoy simplicity over complexity. The seven games that make up this site are: Blackjack, Keno, Roulette, Craps, a progressive slot, dice, and Video Poker. All games have a low minimum bet of .0001BTC, so for players wanting a gaming experience but have small bankrolls, Bitcoin Video tailors to those specific needs. They also have a unique login to their casino. Player’s aren’t forced to register to play, and can keep coming back to play as long as they do not clear their cookies, due to the site using a unique URL log in. Of course, players also have the ability to create a log in, if so desired. An auto-bet option is included for each game, if players want to play without having to click on deal/roll after every hand, who plan on betting the same amount. Bitcoin Video Casino also has implemented a user chat, where players online are able to communicate with other players and see big wins, throughout the network, as they happen. While Bitcoin Video Casino will not “Wow!” a player with it’s layout, it will provide a change of pace to a more retro and classic casino feel, for players desiring those qualities. Bitcoin Video Casino offers instantaneous deposits, once they hit the Blockchain, and instant withdrawals, once the previous deposit has had at least one confirmation. Larger withdrawals may require manual approval, but should take no more than an hour or two, at tops, to complete the request. No minimum withdrawal nor deposit has been listed. No bonus offers have been listed, up to this point. The only bonus that could be achieved is winning a jackpot playing the progressive slot. Player support at Bitcoin Video Casino can be accessed through email, or through the live player chat. Support questions usually take no longer than up to six to eight hours. Although that is considered borderline slow compared to the industry average, answers are always provided in a professional manner. The fairness of game play at Bitcoin Video Casino is “provably fair”, an industry standard for all non-third-party gaming software. Players are able to confirm a win or a loss, through verification, by checking game hashes. When first accessing Bitcoinvideocasino.com, players might be turned off by its rather old-looking interface, and the lack of games that are provided. As far as what Bitcoin Video Casino has set out to accomplish, they have done exactly that. Provide a simple, retro-style casino that provides bankrolls of all quantity, a place to play classic games, in a classic style.